Barcelona is the capital of Catalonia and the economic engine of Spain. The city's impressive architecture and warm climate, draws in more tourists every year than anywhere else in the country. Gran Canaria is the third largest Canary Island off the Northwest coast of Africa. It is an island with green mountainous areas contrasted with desert and filled with white sandy beaches interspersed along the coastline. There are also many archaeological sites to keep those looking for some culture interested. Tenerife is one of the largest Canary Islands and hosts beautiful scenery, relaxing beaches and many activities to keep visitors entertained. Tenerife is home to large shopping facilities, beautiful walks with stunning views and also offers the chance for visitors to enjoy some whale watching on the water. Very popular with the tourists, Funchal is known for its nightlife and for being the birthplace of Cristiano Ronaldo. With its mediterranean atmosphere and climate, the city, and indeed the island, boast a wide range of places of interests and fun activities to take part in, whether you’re travelling solo, or with family. Malaga has long been a popular holiday destination for British tourists. Located on the Costa del Sol, along the southern coast of Spain, Malaga enjoys yearly warm weather and sandy beaches perfect for those looking for some relaxation. The provincial capital of the Valencian Community serves as a gateway to the huge influx of tourists that flock to the Costa Blanca resorts every year. Alicante is popular with holidaymakers who arrive for the warm, Mediterranean climate and seemingly endless golden beaches. However, there is much more to this city than sand and sun. With a picturesque waterfront, a hugely impressive castle, buzzing nightlife and a rich, complex history, Alicante is a fascinating destination all year round. With lots of space, you will have an amazing getaway in these fantastic Penthouses. Features a bedroom with queen-size bed and luxury bathroom with shower, in addition to the living area, dining area and private balcony. Includes butler and concierge service. These Penthouses sleep up to three guests, and include a bedroom with queen-size bed, luxury bathroom with shower, living area, dining area, additional bedding to sleep one more guest and a large private balcony to enjoy the view from. Includes butler and concierge service. These Owner's Suites with a Large Balcony are great for up to two guests. They include a living room, dining room and separate bedroom with king-size bed. Along with a walk in closet, luxury bathroom with whirlpool tub and a large aft-facing balcony with an incredible view. Includes butler and concierge service. These Oceanview Staterooms have enough room for up to three guests. Each includes two lower beds that convert into a queen-size bed and additional bedding to accommodate one more. Passengers also have an amazing view to enjoy from the big picture window, along with room service and many more amenities. These Oceanview Staterooms have room for up to three guests, with two lower beds that convert into a queen-size bed and a pull down bed in some to accommodate one more. They also have a porthole to enjoy an amazing view. These Inside Staterooms are the most affordable way to cruise. There's room for up to four guests and they include two lower beds that convert into a queen-size bed. And of course, room service and many other amenities are also included. The Café is located in the lobby and serves speciality coffees and fine pastries. Enjoy delicious cannoli and cupcakes from Carlo’s Bake Shop by Buddy Valastro, star of the popular television series "Cake Boss" and "Next Great Baker", available in the Café at the Atrium. Enjoy classic cruise-style dining in a more intimate atmosphere with views of the sea and sky. Welcome to Windows, where you can enjoy delicious menus served in a beautiful room with, as its name suggests, a fabulous panoramic view. Going down to the pub takes on new meaning at Henry's Pub, a traditional English-style pub featuring dartboards, large screen TV's, fish and chips and real beer on tap. The Shogun Asian Restaurant also has a Sushi and Sashimi Bar where you can enjoy the very best sushi and sashimi expertly prepared as you watch. Flying shrimp. Onion volcanoes. Twirling knives. The sizzles and surprises never cease at our authentic Japanese Teppanyaki restaurant. Sit around a lively shared table as a skilful chef slices, chops and grills steak, seafood and chicken on a large steel grill right before your eyes. Their chilled, sake-infused Wasabi Cocktail will have you flipping too. This elegant adventure into Pan Asian fare is a world-class experience in the finest authentic Japanese, Thai and Chinese cuisine. If you can't come to the restaurant, bring the restaurant to you. Offering a menu of items, which can be prepared and brought to your stateroom. Room Service is available 24-hours a day (There will be a delivery charge from Midnight - 5 am). Choose from a delicious selection of ready-to-cook omelettes, waffles, fruits, soups, ethnic specialties and pasta in this buffet-style indoor/outdoor restaurant. From the theatrical Art Nouveau décor to the menu, which offers modern and classic gourmet cuisine, Le Bistro is an ode to all things French. You'll know you've arrived when you see the wine displays surrounding the entrance. 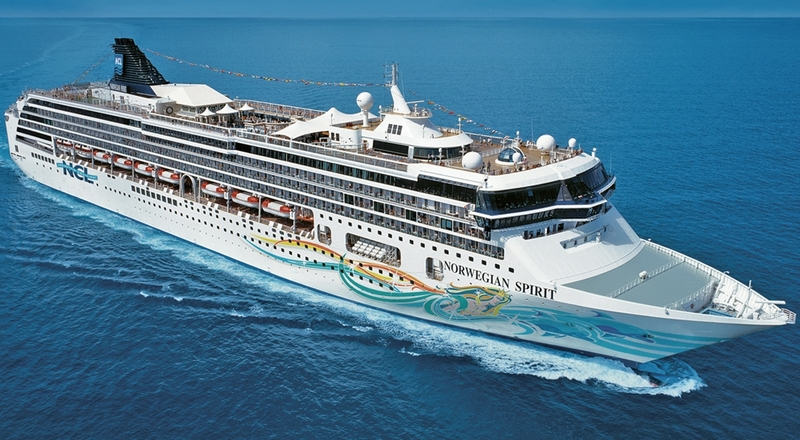 The ocean's very first Pizza Delivery Service is offered 24 hours a day aboard Norwegian Spirit. The Pizza Team is happy to deliver a piping hot, homemade pizza with your favourite toppings directly to your table, your stateroom, or your favourite bar or lounge. Just ask your server or call room service to place your order. "Fresh and Freestyle, that’s Pizza 24/7." In the Bavarian ambience of the Bier Garten on the terrace, you can enjoy German specialities like bratwurst and sauerkraut and, of course, beer. In honour of the midnight snack, they bring you the Blue Lagoon 24 hour Food Court. Whether you're craving a burger or a fast-wok dish, you can enjoy a light bite in a family friendly atmosphere, anytime. Enjoy pasta, pizza and other traditional fare in this casual Italian Trattoria. Dress code is comfortable. Steak is the standard at the American-style steakhouse. Select from choice cuts of Black Angus perfectly prepared like our traditional T-bone or tender Prime Rib. Your mouth will water, so sip your favourite cocktail in anticipation. And don’t forget to order our made-from-scratch jumbo crab cakes and a side of our famous truffle fries. You'll find a well-stocked selection of things to read in this excellent library with a superb ocean view. No matter how far you are from home, having access to the internet is always nearby at the Internet Café. Just your typical sports bar, with an Asian twist. Enjoy a wide selection of premium beers and pub snacks while catching game highlights on the big screen. This friendly, outdoor bar serves snacks and premium beers. Decorated with a classic Art Deco motif, you can enjoy a full range of premium champagnes, accompanied by caviar and foie gras at Champagne Charlie's. All you need now is an excuse to celebrate. There's a lot of fun to be had here. Stop by and capture a few aliens, win a car race, play pinball and fly a jet fighter. Anything is possible at the Video Arcade. Sit back and take in the beautiful colours of the sea and sky as the sun sinks into the ocean with a full bar as a backdrop. Tasty appetizers change daily. Dance the night away at this Bollywood-style lounge and nightclub. This could be your lucky night! Try your hand a one of 158 slot machines. Or play Blackjack, Roulette, Craps, Caribbean Stud Poker™ and Let It Ride™. It's showtime! And there is always a really big show for you at the Stardust. Enjoy Broadway and Vegas-style shows with cocktails before or after dinner in a traditional European opera house-style auditorium reaching up two decks. Here is one room where playing games is not just encouraged, it's expected. Find another couple and play bridge or test your skill with chess, Scrabble® and more. Get down and get funky at this disco. It's the hottest spot on the ship for the hip teen crowd complete with video, jukebox, bar football and air hockey. Charlie's is just for kids. From the very smallest to the biggest, there's a cinema, computer, an arts & crafts section and even quiet spaces with a nursery and a sleep/rest area too. Kids will love Buccaneer's Wet & Wild pool complete with slides, paddling pool and a hot tub just for kids. Upgrade to Free at Sea for £49pp. Choose 2 Offers from the list below. Book a suite and receive all applicable offers at no additional cost. Includes alcoholic and non-alcoholic branded drinks served in all bars, lounges and restaurants throughout your cruise. Enjoy 1 dining opportunities in selected speciality restaurants. Receive $50 shore excursion credit per stateroom per port of call. Guests 3 and 4 in the stateroom pay only the applicable tax for the cruise. Available on select sailings only.